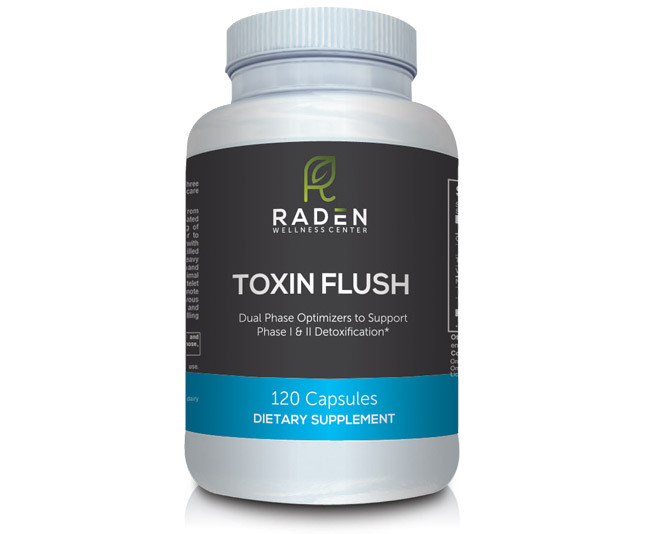 Toxin Flush is designed to promote balanced activity between Phase I and Phase II of the body’s detoxification processes. * It has been formulated to contain select ingredients to support healthy detoxification and enhance the activities of hepatic detoxification enzymes. * The term Dual Phase Optimizers (DPO) refers to those nutrients that have the ability to simultaneously influence and “optimize” the activity of certain Phase I enzymes as well as Phase II enzymes. By balancing and promoting these hepatoprotective properties these substances can favorably influence toxin metabolism and elimination. * The 5-MTHF in this formula, Quatrefolic®, is the most biologically active form of folate, allowing rapid uptake into the bloodstream. * The 5-MTHF in this formula is also known as the “L” form of 5-MTHF since it is the reduced form of folate. Other Ingredients: HPMC (vegetable capsule, MCC (microcrystalline cellulose), rice flour, ascorbyl palmitate, silica.